In a 7245 sq.m park (1.8 acres; of which 0.95 acres are woods), in a quiet and sunny neighbourhood of Curio Malcantone lies this beautiful 19th century villa: Villa Pierina. 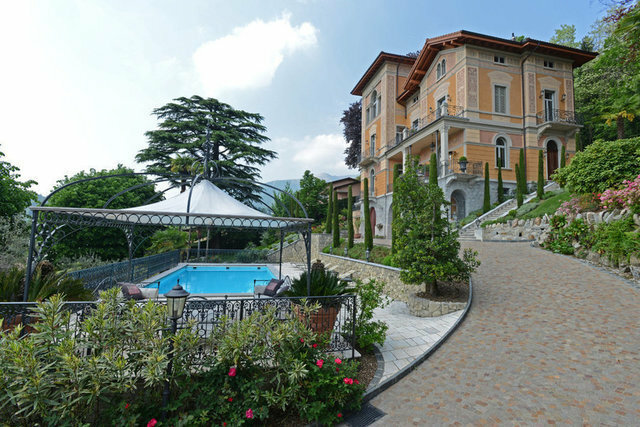 The property is south-east facing and offers a panoramic view on the surrounding mountains and a partial view onto Lake Lugano. It is only 20 minutes drive from Lugano and TASIS, while the airport and ghe golf club are just 10/15 minutes away. This historical "Art Nouveau" villa of 1905 (belonged to family Avanzini), was completely renovated and perfectly restored in 2010/2011. Only high standing materials and luxurious finishes (Versace Home Collection) were used. The villa offers approximately 670 sq.m (7209 sq.ft) living area on 3 floors, elevator, terraces, 5 fountains, heated swimming pool, automatic irrigation system, vacuum cleaning system, alarm system, outdoor video surveillance and 2 garages for 5 cars. Villa Pierina is so divided: GF: entrance hall, dining room, library with fireplace, living room with fireplace, kitchen, guest toilet; 1.FL: 1 bedroom, 1 bathroom, sauna, master bedroom with fireplace, en-suite bathroom and walk-in closet, studio; 2.FL: 4 bedrooms, 2 bathrooms; cellar: 2 wine cellars, laudry, storage rooms, technical room, garage. Special features: - Beautiful historic villa, under protection of historical monuments. - Possibility to build guesthouse (existing project). - Accessible to disabled.